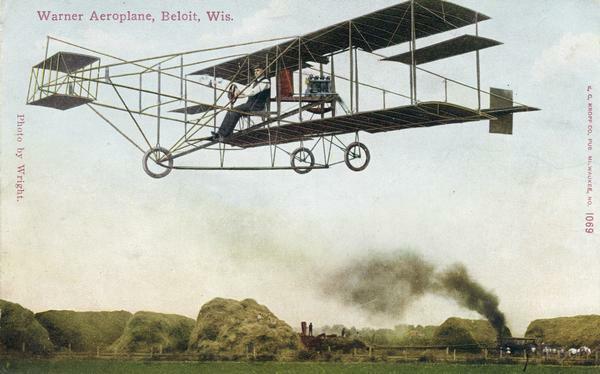 This series of aviation galleries make up an online exhibit marking the centennial of aviation drawn from the picture collections of the Wisconsin Historical Society Archives, the Wisconsin Center for Film and Theatre Research, and the University of Wisconsin-Madison libraries. The Sky High exhibit is divided into eight topical galleries of images from the Wisconsin Historical Images database. Click a gallery title to view the images. Acknowledgements: This exhibit would not be possible without the exhaustive research of Michael J. Goc in Forward in Flight: The History of Aviation in Wisconsin, a Sesquicentennial publication of the Wisconsin Aviation Hall of Fame.